In his recent show at the Saint Louis Art Museum, Wiley wanted to draw attention to real and present people who are often ignored and quickly added to a small box, or treated like a caricature. Here, in his solo show titled “Saint Louis,” the artist chose works in the museum's collection dating from the 1540s to the 1920s and reinterpreted them. Replacing the highly pompous patrons of the originals with honest and current models he recruits by “street casting,” meaning he goes in search of people to paint in specific locales. 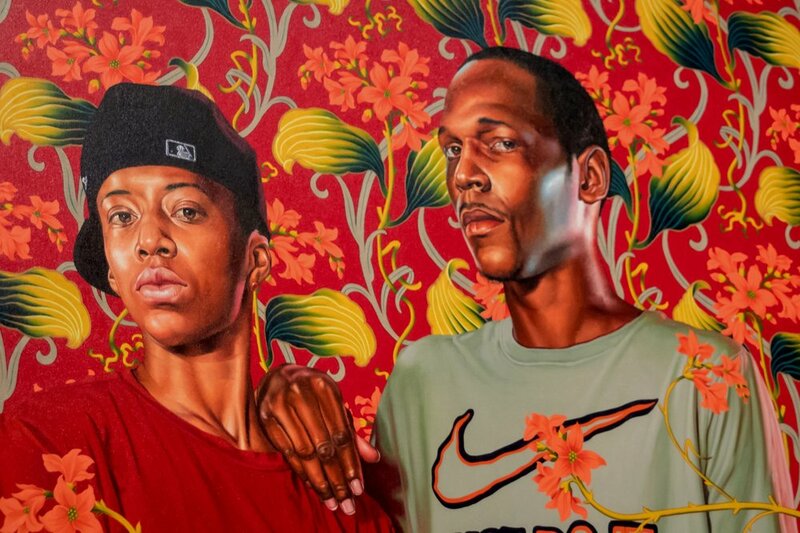 By substituting the subjects, Wiley believes these re-envisioned portraits have the potential to reveal their unique political and social conditions. In addition to the using stark realism and honesty of the sitter, Wiley paints beautiful and detailed backgrounds of ivy and flowers. The artist is quoted on one of his piece’s label saying, “It's almost as though the backgrounds were demanding to be represented as well. Their competition for the picture plane exists in direct relationship with my insistence upon the black body being in the forefront within a museum space, that sense that I deserve to be here, that constant fight for presence.” That is quite evident when in the presence of one of these portraits. Standing tall on the wall, these 8-foot-tall paintings are sensational to the fullest definition of the word. Historically, the original intent of paintings such as these were to re-enforce the power and wealth one had by commissioning a portrait to be done by a classically trained painter, then to hang it in one’s house so when a party was thrown, all guests would quiver and emote jealousy for the work. For Wiley, that bravado of the rich is a bit ironic in that the scale of his works has quite a price tag attached. The frames alone probably cost $1,000 apiece. However, that irony is offset by choosing overlooked, everyday subjects who seem to represent the lower class, and ones who could never afford to commission a piece of this magnitude for themselves. However, in that scenario, the subjects, or “sitters” as Wiley calls them, become props. Being used as a visual aid to hammer home his message. I completely agree with the importance of the message Wiley is sending. To showcase these individuals with such big paintings on huge white walls inside of an acclaimed museum is a long time coming. However, for me, the lack of complete coherency of intent happens exactly because of these choices. The original paintings were done as commissions for prominent people of society for use in their own homes. They were never meant to end up in a museum or part of a collectors horde. They were not meant to become prized pieces of artwork and accumulate such value. Wiley’s paintings are the opposite.